In order to comply with CIPA, we provide web filtering for staff computers, public computers as well as devices that the customers connect to the library's wireless network. 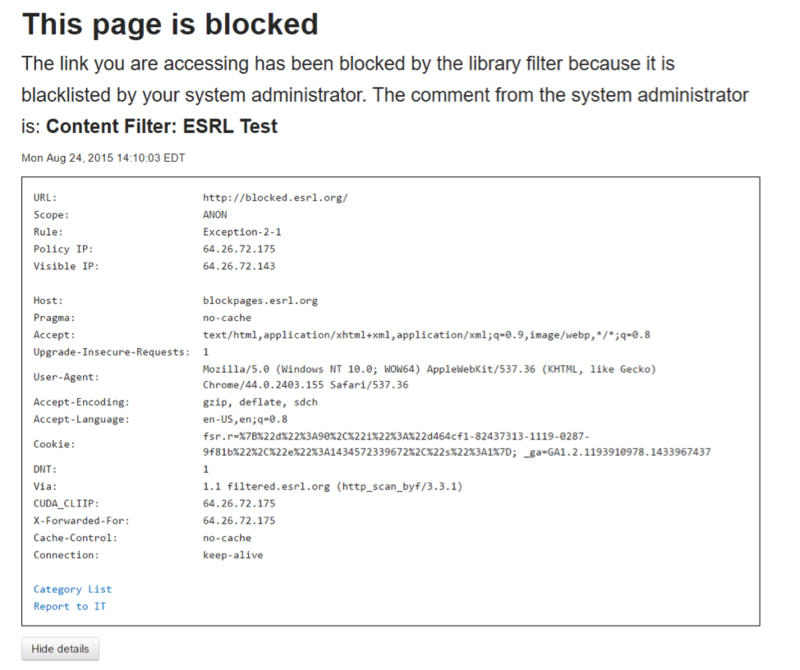 The filtering policies themselves (as in, the lists of what types of content to block) are determined by the library system, not ESRL. In addition to the filtering policy, all filtering also includes some antivirus, antimalware and anti-phishing protection. This protection is not expected to be perfect or comprehensive (none ever is) and is not a replacement for antivirus software or common sense. ESRL suggests that staff computers, at a minimum, use our "unfiltered" filter which includes only the virus/malware/phishing protection. Staff computers may have stricter settings based on local library system policy. Filtering on the wireless segment cannot be disabled individually. If a customer needs an unfiltered connection (and local policy allows) they can be signed in to an unfiltered session on a public computer. We are unable to filter any device that has its own data plan, only devices that connect to the library wifi. The reason the page is blocked is given in bold, in this case "Block Example". ESRL makes every effort to make sure that legitimate sites are not blocked accidentally, however no system is perfect. In the event that a legitimate site is blocked, click the "View details" button to show more information, then click the "Report to IT" link and contact Jim or Eli at ESRL about the page. IT staff will not take any action about any page reported unless a library staff member also contacts us about the report. The "Category List" link in the block page details takes you to a page describing all the possible filtering categories.